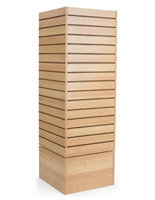 These maple slatwall panels can be configured with any number of slatwall accessories that you choose. Constructed of two slatwall panels back-to-back, these slatwall fixtures provide a large display area without taking up much floor space. 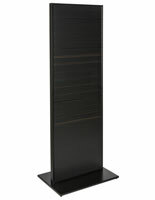 Since both slatwall panels measure 2'w x 4'h, you get 16 square feet of display space! Mix and match accessories along your slatwall displays to create one-of-a-kind store fixtures. These slatwall accessories easily hook into panel grooves in just seconds. Because they are so easy to use, these slatwall panels are popular products in retail stores, information centers, and convention halls. 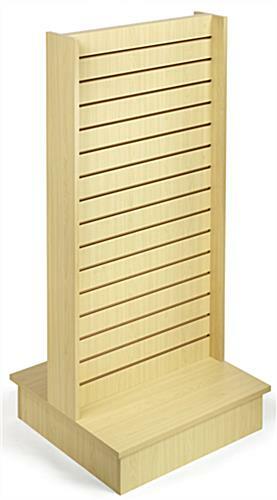 As such versatile store fixtures, these slatwall panels are ideal for a multitude of uses. Slatwall panels are great in retail and grocery stores, holding clothing, sporting goods, food products, and samples. These slatwall displays are also ideal for convention halls and exhibits. 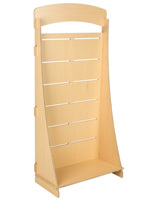 You can use sign frames and brochure pockets to advertise products and distribute informative literature. However you decide to use your slatwall panels, they will help you create high-impact, customized displays that will look great anywhere. 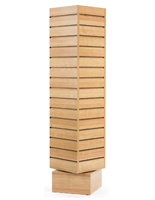 These slatwall panels are constructed of maple colored particleboard materials. 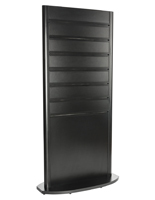 At the bottom, a 24"w x 6"h x 24"d base provides support so that your display won't wobble or fall over. The grooves in the slatwall are spaced 3" apart to accommodate standard sized slatwall accessories. Since these slatwall panels are unfinished, you can see the raw wood-colored particleboard inside. 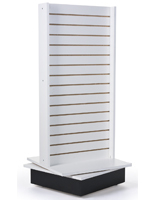 Use slatwall panels, accessories and other slatwall fixtures to create unique displays for your store.